The thorough Guide to Trademark Trial and Appeal Board (TTAB) Practice takes you step-by-step through the entire process, covering claims for relief, defenses that can be asserted in opposition and cancellation proceedings, motion practice, mailing and service, discovery, evidence, proving your case, objecting to evidence, appeals, settlement and more. As trademark law continues to evolve, so do the reasons practitioners might find themselves before the Trademark Trial and Appeal Board ( TTAB). Cutting-edge business concepts, breakthroughs in technology, and the increasing variety of forms of commerce are all bringing new and interesting challenges to trademark practice. 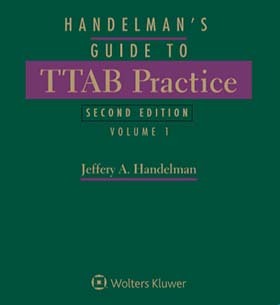 Only Guide to TTAB Practice helps you with practice and procedure, as well as substantive law. Whether you're a rookie or a veteran, Guide to TTAB Practice makes certain you're fully prepared for every TTAB proceeding. This one-of-a-kind, nuts-and-bolts resource created by an expert practitioner takes you step-by-step through the entire process and tells you everything you need to know about practicing before the TTAB. Settlement—the chapter on settlement presents the most effective ways settlements can be structured in accordance with the governing Trademark Rules of Practice. 7.13 Factor No. 4: Does the Design Offer a Comparatively Simple or Cheap Method of Manufacturing? 10.24 Should Secondary Meaning Developed During the Life of a Patent Be Given Legal Effect After the Patent Expires? 13.17 Priority Based Upon Foreign Rights 14. 18.03 Is a Survey Needed? 27.16 Is the Excepted User Entitled to a Concurrent Use Registration?